As chronicled here, my previous attempt to get a Whatafarm resulted in the lady at the counter looking at me like I was a total wackjob -- she had zero idea what I was talking about. And why should she? 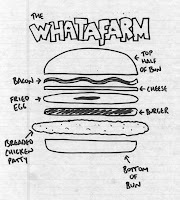 It turned out that the Whatafarm isn’t an actual menu item. Rather, it’s a burger Frankensteined together from parts of other sandwiches -- burger patty, fried chicken breast, bacon and a fried egg. But thanks to the Whataburger company philosophy of “Just Like You Like It,” while you can’t order a Whatafarm by name, they’ll still make it for you. You just have to tell them how. “Hello,” I said. We locked eyes intensely -- she knew I meant business. I precisely withdrew the diagram from my classy leather portfolio, placed it on the counter, paused briefly for effect, and then slid it toward her with authority. “We’d like three of these, please.” This may have all been followed with a sideways head nod for even greater emphasis. The cashier called somebody else to the front, and I feared this was all about to go south, but really she just needed help figuring out how to ring up the sandwich. She ended up doing it as a Whataburger, add cheese, bacon, a chicken filet and egg. The grand total for one Whatafarm plus tax was $7.70. She also complimented my diagram. The entire time our sandwiches were being made, there was one guy in the back giving me crazy eyes. He seemed to be waging an internal battle as whether or not to state his conscientious objection to the very notion of the Whatafarm -- for like Skynet, just because you can build something doesn’t mean you should. It could destroy us all! And then on top of that, he was starting to get angry that he even had to wrestle with this ridiculous sandwich-related moral dilemma -- hence the crazy eyes. Or at least that’s what I think was going on in his head. The two employees that brought us our Whatafarms stood by to watch the grand unveiling -- mine was so huge I could barely take a bite. We didn’t specifically ask for veggies, but that’s how they made them, and I think that really enhanced the overall “an entire farm in a burger” experience. Bravo. When those two employees went on break a few minutes later, they totally ordered themselves a couple of Whatafarms of their own. We all agreed -- the Whatafarm is delicious. But of course it’s delicious. It’s a burger plus fried chicken plus bacon. Only the fried egg might some find questionable. Personally, I’m a fan of fried eggs on burgers. This was a long time coming. So was the Whatafarm awesome? Yes, it was awesome. Was the Whatafarm worth the wait? Yes, it was worth the wait. I will never order one again. Lunch Blog would like to take this opportunity to give much-deserved credit to alanbeam.net -- true creators of the Whatafarm. You are men of great vision, and we salute you.